In the Tutorial, we focused on how to perform a calculation. Now, we'll provide a brief description on what you might do with the results of the calculations, and in particular how you might visualize the results. We'll focus on two systems: 2d and 3d. The geometry_lattice input defines the primitive lattice vectors basis1 and basis2 of the periodic lattice (R₁ and R₂ below), here for a triangular ("hexagonal") lattice, which determines the periodicity of the structure ε(r). This choice of basis vectors, in turn, determines a reciprocal lattice in which the Bloch wavevector k is periodic. The k_points variable specifies the k vectors for which we compute the band structure ω(k) in the basis of the reciprocal-lattice vectors (G₁ and G₂ below). In this tutorial, we choose the k_points along the edges of the irreducible Brillouin zone, whose corners are conventionally called Γ, M, and K for this lattice. The diagram below shows the lattice and reciprocal lattice, our choice of basis vectors, the corresponding reciprocal-lattice basis vectors, and this irreducible Brillouin zone (IBZ). Our online textbook has more information on lattices and Brillouin zones in Appendix B. Note, however, that for a given lattice there are multiple choices of basis vectors and irreducible Brillouin zones that are equivalent according to the symmetry of the lattice, and the book uses a slightly different choice for the triangular lattice. Notice that we're computing both TM and TE bands where we expect a gap in the TM bands, and are outputting the z component of the electric field for the TM bands at the K point. The fix_efield_phase will be explained below. The file meep/python/examples/mpb_data_analysis.py imports the tri-rods file and does the data analysis explained below. It should finish in a few seconds. In most cases, the first thing we'll want to do is to look at the dielectric function, to make sure that we specified the correct geometry. We can do this by looking at the epsilon.h5 output file. This image initially seems wrong! Why is the rod oval-shaped and not circular? Actually, the dielectric function is correct, but the image is distorted because the primitive cell of our lattice is a rhombus with 60 acute angles. Since the output grid of MPB is defined over the non-orthogonal unit cell, while the image produced by h5topng and most other plotting programs is square, the image is skewed. As you can see, the rods are now circular as desired, and they clearly form a triangular lattice. The first five gaps are for the TM bands (which we ran first), and the last gap is for the TE bands. Note, however that the < 1% gaps are probably false positives due to band crossings, as described in the tutorial. There are no complete (overlapping TE/TM) gaps, and the largest gap is the 47% TM gap as expected. See our online textbook, appendix C. To be absolutely sure of this and other band gaps, we would also check k-points within the interior of the Brillouin zone, but we'll omit that step here. Next, let's plot out the band structure. To do this, we'll first extract the TM and TE bands as comma-delimited text, which can then be imported and plotted in our favorite spreadsheet/plotting program. 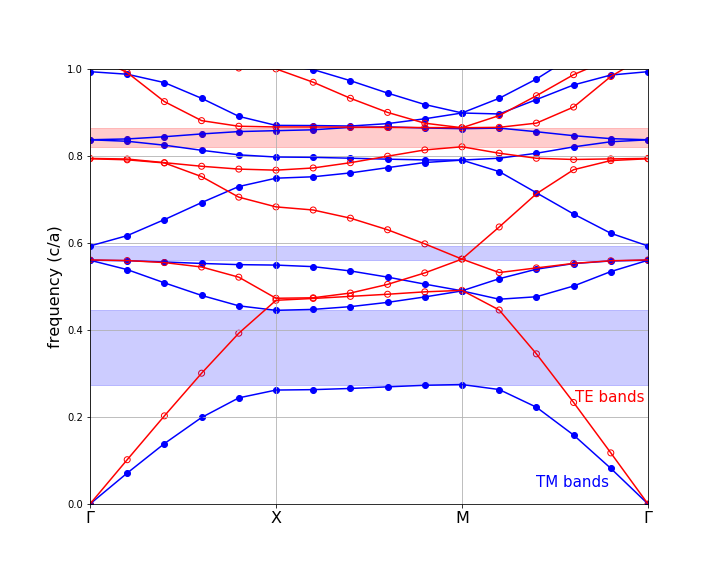 The TM and TE bands are both plotted below against the "k index" column of the data, with the special k-points labelled. TM bands are shown in blue (filled circles) with the gaps shaded blue, while TE bands are shown in red (hollow circles) with the gaps shaded red. Note that we truncated the upper frequencies at a cutoff of 1.0 c/a. Although some of our bands go above that frequency, we didn't compute enough bands to fill in all of the states in that range. Besides, we only really care about the states around the gap(s), in most cases. Now, let's actually examine the electric-field distributions for some of the bands which were saved at the K point, remember. Besides looking neat, the field patterns will tell us about the characters of the modes and provide some hints regarding the origin of the band gap. Here, we've used the bloch_phase=True keyword argument to get_efield to multiply the result by its Bloch phase (see Stored Fields and Bloch Phases). Note that we only plot the real part of the z component. Since these are TM fields, the z component is the only non-zero part of the electric field. The real and imaginary parts of the fields correspond to what the fields look like at half-period intervals in time, and in general they are different. However, at K they are redundant, due to the inversion symmetry of that k-point (proof left as an exercise for the reader). Usually, looking at the real parts alone gives you a pretty good picture of the state, especially if you use fix_efield_phase (see below), which chooses the phase to maximize the field energy in the real part. Sometimes, though, you have to be careful: if the real part happens to be zero, what you'll see is essentially numerical noise and you should switch to the imaginary part. Your images should look the same as the ones above. If we hadn't included fix_efield_phase before output_efield_z in the .py file, on the other hand, yours would have differed slightly (e.g. by a sign or a lattice shift), because by default the phase is random. When we look at the real parts of the fields, we are really looking at the fields of the modes at a particular instant in time and the imaginary part is half a period later. The point in time relative to the periodic oscillation of the state is determined by the phase of the eigenstate. The fix_efield_phase band function picks a canonical phase for the eigenstate, giving us a deterministic picture. First, the origin of the band gap is apparent. The lowest band is concentrated within the dielectric rods in order to minimize its frequency. The next bands, in order to be orthogonal, are forced to have a node within the rods, imposing a large "kinetic energy" (and/or "potential energy") cost and hence a gap. See our online textbook, ch. 5. Successive bands have more and more complex nodal structures in order to maintain orthogonality. The contrasting absence of a large TE gap has to do with boundary conditions. The perpendicular component of the displacement field must be continuous across the dielectric boundary, but the parallel component need not be. We can also see the deep impact of symmetry on the states. The K point has C3v symmetry and not quite the full C6v symmetry of the dielectric structure. This symmetry group has only one two-dimensional representation--that is what gives rise to the degenerate pairs of states (2/3, 4/5, and 7/8), all of which fall into this "p-like" category where the states transform like two orthogonal dipole field patterns, essentially. The other two bands, 1 and 6, transform under the trivial "s-like" representation with band 6 just a higher-order version of 1. Now, let us turn to a three-dimensional structure, a diamond lattice of dielectric spheres in air. See our online textbook, ch. 6. The basic techniques to compute and analyze the modes of this structure are the same as in two dimensions, but of course, everything becomes more complicated in 3d. It's harder to find a structure with a complete gap, the modes are no longer polarized, the computations are bigger, and visualization is more difficult, for starters. # the "Data Analysis Tutorial" section of the MPB manual. # A simple fcc lattice would have only one sphere/object at the origin. As usual, all distances are in the dimensionless units determined by the length of the lattice vectors. We refer to these units as a, and frequencies are given in units of c/a. By default, the lattice/basis vectors are unit vectors, but in the case of fcc lattices this conflicts with the convention in the literature. In particular, the canonical a for fcc is the edge-length of a cubic supercell containing the lattice. In order to follow this convention, we set the length of our basis vectors appropriately using the basis_size property of the Lattice class. The lattice vectors default to the same length as the basis vectors. If the cubic supercell edge has unit length (a), then the fcc lattice vectors have length sqrt(0.5). We can also plot its band diagram, much as for the tri-rods case except that now we can't classify the bands by polarization. The resulting band diagram, with the complete band gap shaded yellow, is shown below. Note that we only computed 5 bands, so in reality the upper portion of the plot would contain a lot more bands which are of less interest than the bands adjoining the gap.